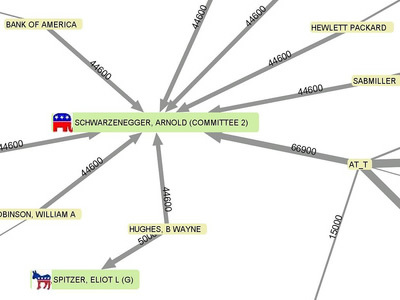 Similar to Unfluence, this visualization tool lets users visually explore the relationships between 100 donors and US Governors elected in 2006. Currently the application shows only donors who donated to more than one candidate, or pursued a single donation higher than 100,000 USD. The application, inspired by a conversation with Daniele Galiffa, was produced by Marco Borgna using data from The National Institute on Money in State Politics. The Institute is a nonpartisan, nonprofit organization revealing the influence of campaign money on state-level elections and public policy in all 50 US states. 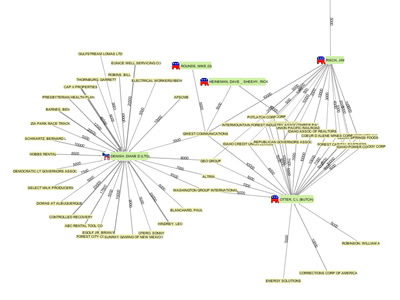 Their campaign-finance database and relevant issue analyses are available for free through their website FollowTheMoney.org. For other projects in VC mapping political donations and public contributions, check here.